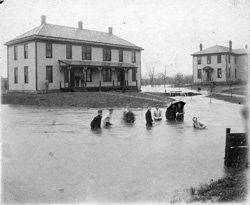 Description: Flooding at Bethel College. Looking northeast? Minnesota Home in the center, other building unidentified. 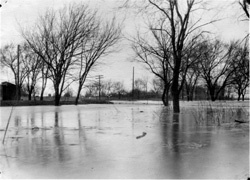 Description: Flooding at Bethel College. Looking north at Minnesota Home. 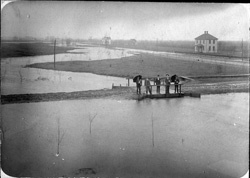 Description: Flooding at Bethel College. Looking southwest. 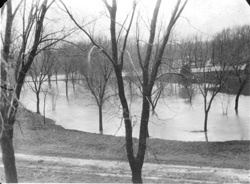 Description: Flooding at Bethel College. Looking a little south of west. Minnesota Home in foreground, Krehbiel/Wirkler house in left background. Used in 1917 Graymaroon, p. 101. 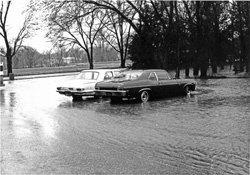 Description: Flooding at Bethel College. Looking south at Alumni Hall, now location of Schultz Student Center. On the back is handwritten "Possum". 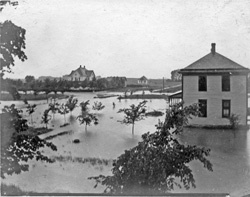 Description: Flooding at Bethel College. Looking west towards Main Street? On the back is handwritten "Possum". 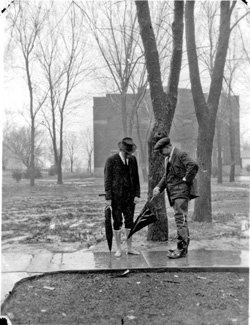 Description: Flooding at Bethel College. Not clear where exactly this is or what direction it is facing. On the back is handwritten "Possum". Description: Flooding at Bethel College. Maybe looking southwest from the west end of Goering Hall. Used in 1973 Thresher, p. 20, with no caption.